Take 2 capsules one hour before bedtime. For daytime use: Take 1 capsule with water at mealtime. Take 3 capsules 1 hour before bedtime. For intensive use, consult your healthcare professional. Take three capsules with water 30-60 minutes prior to bedtime. For intensive use, take four to six capsules. Herbal Sleep Aid!Herbal Sleep Aid! 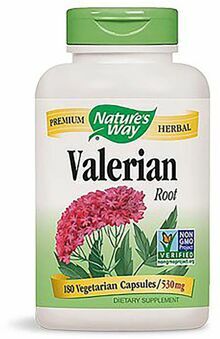 Valerian Nighttime is a unique blend of Valerian and Lemon Balm extracts clinically proven to promote restful sleep. Unlike other sleep aids that may cause a tired feeling or lack of mental focus the next morning, Valerian Nighttime leaves you feeling fresh and energized. Odor Free: Valerian Nighttime's exclusive Dual Control coating naturally protects its active ingredients and locks out the pungent aroma of valerian. Stomach Gentle: Valerian Nighttime contains Lemon Balm extract to soothe the stomach before bedtime.